Good day, everyone! After our elaborate Mother’s Day sweet feast and an extra couple of pounds, how about something light and versatile such as these fresh Heart of Palm Salad Skewers (Salada de Palmito no Espeto)? Heart of palm, also known as palm heart, is a vegetable harvested from the inner core of certain palm trees such as coconut, açaí, pupunha, among others. In my home country, Brazil, heart of palm is consumed by itself as well as incorporated into various salads, of which this traditional heart of palm salad is the most popular. Also, it is often used as a filling for empanadas and empadinhas (mini pot pies). Hearts of palm are also great in bisques and soups, stews, baked rice, etc. Palm hearts are considered a delicacy due to the labor-intensive process needed to harvest them. The Northern states of Pará and Amapá have become the largest producers and exporters of hearts of palm in Brazil since the 1980’s. Brazil used to be the highest exporter of uncultivated hearts of palm, but in the 90’s lost its position to Ecuador and its cultivated hearts of palm. France still remains the largest importer though!!! Hearts of palm are available fresh or, more usually, canned or in jars, available both online and at Latin markets. 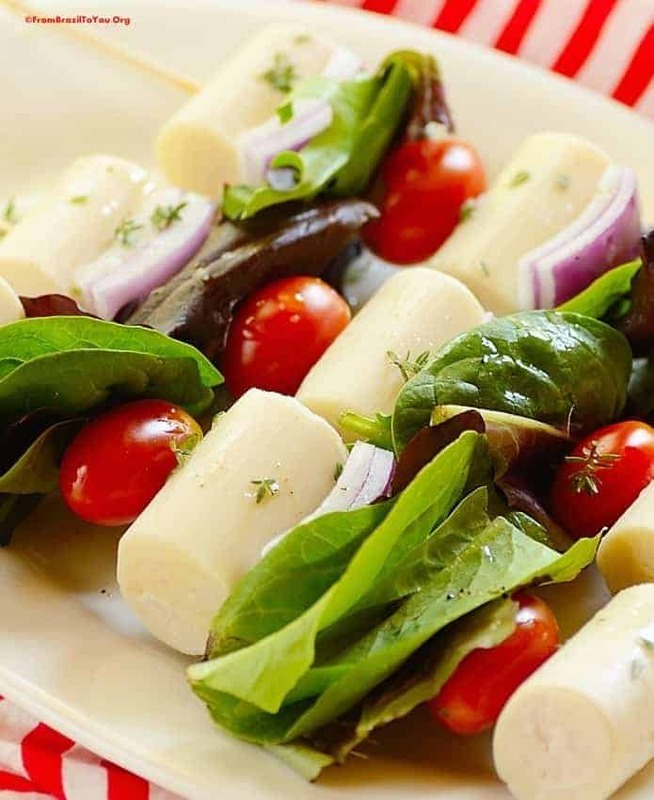 These heart of palm salad skewers are very versatile! They can be served as an appetizer or main dish depending on the size of the skewers, or even as a side dish for a summer barbecue. Enjoy our heart of palm salad skewers (or salada de palmito no espeto)… and have a healthy week!!! Have you ever tried hearts of palm? 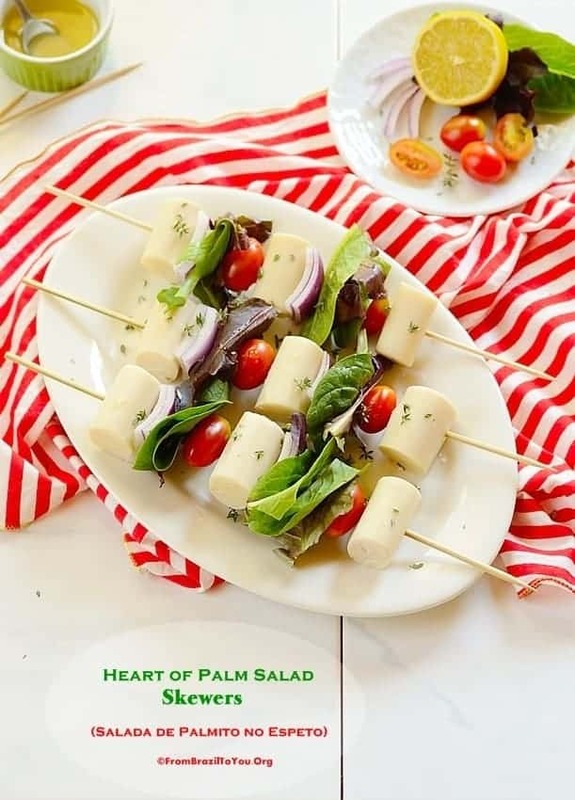 Heart of palm salad skewers are a fun, healthy, vegetarian dish that can be served as an appetizer, main dish or an accompaniment for a summer barbecue. 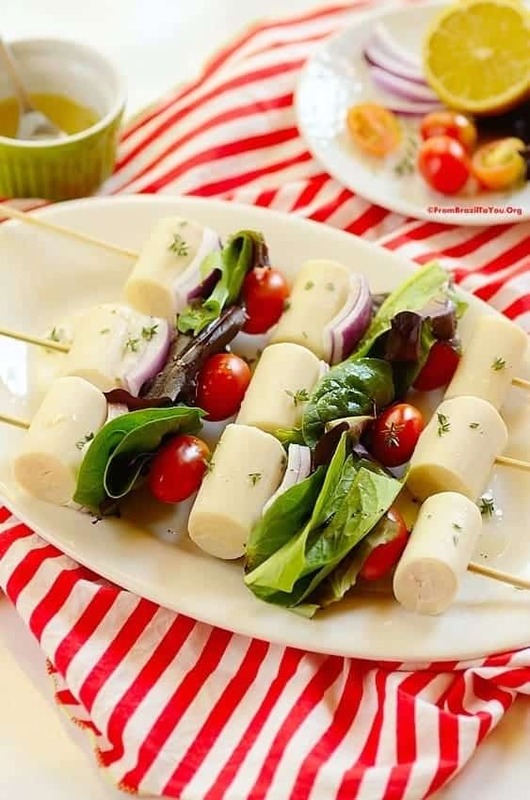 To prepare the salad, assemble 4 heart of palm salad skewers by inserting and alternating heart of palm chunks, grape tomatoes, salad leaves, and chunks of red onion (optional) as shown in the pictures, or as desired. Each of our skewers contains 3 heart of palm chunks, 2 grape tomatoes, salad leaves, and 2 to 4 chunks of red onion. Once skewers are assembled, chill in refrigerator for about 30 minutes, covered with a wet paper towel. Meanwhile, prepare the dressing. In a small bowl, whisk all the ingredients together well until obtaining a thick and homogeneous dressing. Drizzle the heart of palm salad skewers with the dressing, sprinkle with thyme leaves, and serve! Previous Post: « The 12 Best Sweet Treats for Mother’s Day! Heart of palm, I’m sorry to say, is an underutilized ingredient in my kitchen. My loss, because it’s such good stuff. And this looks so excellent! Terrific recipe — thanks. Thanks, John! I love heart of palm…It is a very versatile ingredient and quite tasty as well. I hope you can try to incorporate this in your recipes. It is low cal and contain fiber. so here I go – but this time I SWEAR I’ll make this before this upcoming weekend is over. and I am using all your readers as witnesses. HA! too good to pass, I love love LOVE this presentation! Thanks so much, Sally! 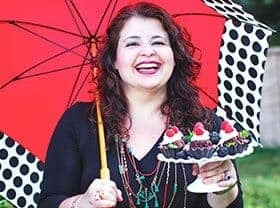 I do appreciate your interest in my recipes and I hope you can make them when you have a chance… and enjoy. My husband and I devoured all these salad skewers by ourselves. My kids did not have even the chance to taste them. 🙂 It is something quick and simple yet hearty and delicious. You won’t regret to make them. Wishing you a great day! These look wonderful Denise. I always forget about hearts of palm and how delicious they are. I love the idea of serving your salad on skewers! Thanks, Chris! I though it would be fun to present the salad on skewers and proper for a summer barbecue. Me too, Nydia! I do really need to shed the pounds gained but eating something delicious and fresh such as this salad on skewers. I adore the lower-calorie salad on a skewer! Including hearts of palm instead of cheese is such a great idea! Who knew salad could be so enticing! Hi, Deb! Thank you… I am already thinking to make this again! These look so delicious! Can’t wait to try them. Thank you! It is always my pleasure, Kathleen! I hope you enjoy these salad skewers as much as my hubby and I did. Love Hearts of Palm. I just did a salad with it a few weeks ago! Totally good! Thanks, Abbe! I am glad that you enjoy this Brazilian vegetable. ohhh i love hearts of palm. These look lovely! I don’t think I have ever tried heart of palm but it sounds great. Your salad looks terrific, Denise. I loved the versatility of these skewers. These look so fresh and yum, Denise! Ainda não experimentei palmito à Parmegiana, mas adoraria. Essa é uma excelente idéia mesmo. Obrigada pela sugestão! Obrigada pela visita. Um bom fim de semana pra você! Hi Denise. What a lovely blog! My mom loves hear of palm, and I would love to surprise her with this salad the next time she comes over. Thank you for sharing! It is always my pleasure, Monet! I hope your mother enjoys this as much as we did. I am already looking forward to making this again, especially in the high summer. It is refreshing and wholesome! I’ve never heard of these before…. This is a totally new ingredient for me. Thanks Denise for sharing. It is my pleasure to share new ingredients here, Amira! Palm hearts are new to me but they do sound amazing. This salad is so refreshing..I feel healthier just looking at it:-) I love the vibrant colours and flavours. 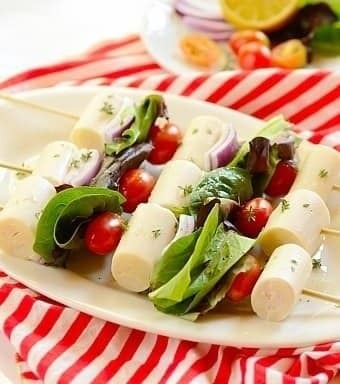 I love hearts of palm…my mom introduced us to it when we were kids 🙂 And your skewers look like a terrific way to enjoy them! Thank you, Liz! I grew up eating hearts of palm in many different dishes and really having an appreciation for them.